The automaker Citroen and the French fashion house Courreges recently joined hands and came up with the Citroen e-Mehari by Courreges Concept 2016 at the 2016 Geneva Motor Show. The fully electric four-seater cabriolet might look quirky at first sight but as the quote goes, ‘you might love, you might hate but you can’t resist. 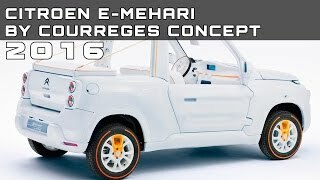 Let us have a look at the review of Citroen e-Mehari by Courreges Concept 2016 to know in detail about it. Though nothing much has been shared in context to the interior of Citroen e-Mehari by Courreges Concept 2016 but looking at the pictures we can notice the impeccable blend of white and orange stripe. The seats are wrapped in which leather and so are the door linings, dashboard. Use of Orange can be noticed in form of vinyl trim across the dash and air vents. The single spoke monochrome steering wheel is another distinct inclusion and gets complimented further by the leather-lined floor that has white color mats. 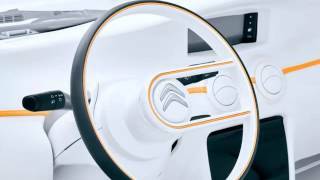 Thus rounding up the interior details of Citroen e-Mehari by Courreges Concept 2016 as of now I can just say that expect the bright color game that will steal the attention. The exterior of Citroen e-Mehari by Courreges Concept 2016 is simple yet catchy. Again the major role is played by the white body that gets complemented by the contrasting orange strip over the wheels and the black lining over front windshield and across the hood. The slim headlights are integrated over the either corners of the hood while beneath we have set of fog lamps getting accompanied by round side indicators. Looking from the side you can see the black door handle mounted over the white gate while the black outline defining the shape adds to the glory. At the rear we can see the range hoop that’s another star to the look of the model. Thus concluding the exterior details of Citroen e-Mehari by Courreges Concept 2016 I would say, model looks unique, bit of quirky and can be expected to have as production version soon. 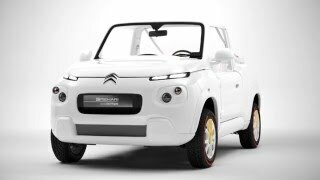 Powering the Citroen e-Mehari by Courreges Concept 2016 is a lithium metal polymer battery that can take the top speed of Citroen e-Mehari by Courreges Concept 2016 to 68 mph while the range limit stands at 124 miles upon full charge. The battery takes approx eight hours to get fully charged through a 16A socket while with the domestic 10A wall socket it will take about 13 hours to get charged.